"Big Week - Days Five to Seven"
No you haven't missed anything, but you might have just come late to the party. Drawing the line at US$2.99 at DC means that all the "Second Features" were killed off prematurely, last week you might have picked up the outstanding Giant Sized Atom and so after a decade languishing in development hell and a long held story by Kurt Busiek, DC decided Chloe Sullivan's introduction into continuity would be here in (insert fanfare) a half reprint/half new material one off one shot. Now because in the regular reviews you'll have already read "Days One to Four" we'll just do the unreleased material. You can find the previous chapters in Action Comics #893, #894, #895 and #896. So now onto the story! Having realized he's about to marry a relative of Mr. Mxyzptlk Jimmy races into bathroom. When he gathers up the nerve to confront Maggie Mxyzptlk he is distracted by his signal watch buzzing like mad. Puzzled he is bewildered to discover he is secretly Co-Superman in disguise! The emergency is Doomsday, which Co-Superman makes short work of. Life is great, he is the world's greatest champion, Sebastien Mallory is in prison and at the Daily Planet, Perry is now publisher, Lois, editor and Jimmy, the best reporter on staff! The weirdness continues and as he covers a presentation of the Key to Metropolis to Co-Superman, he bumps into Chloe in the crowd. She seems genuinely sad that Jimmy is about to get married and alludes to things she loved about Jimmy before their break up. Jimmy cuts it short when he realizes the crowd is waiting on him to arrive in his cape and tights, something he regrets as there was obviously a spark between he and Chloe. When Jimmy returns home he finds a note from Maggie, she reveals that everything that's happened to him since leaving the bathroom Maggie had created a portal to a pocket universe where Mallory his nemesis was in prison, his career had taken off, he was an honored superhero and he had the heart of the woman he loved. If he wanted, Jimmy could stay there and live in his utopia, if not go back into the bathroom, then he and the world around him would return to normal. After the experience in the pocket universe Jimmy is now determined to make his life mean something by taking down Mallory and winning back Chloe. Heading to the Steelworks, Jimmy has Natasha Irons adapt the old Daily Planet copter 'The Flying Newsroom' into a spacecraft. Jimmy tries to get in touch with his friends Rory & Kev at S.T.A.R. But finds them and pretty much the entire population is busy obsessively playing Superman: The Videogame. Meanwhile Chloe and Sebastien are on a date in his orbital apartment high above the Earth. Tricking Mallory into leaving her alone to get some wine with some flirting, she quickly hacks into his computer systems. It turns out that she has been investigating Mallory all along. Someone that looks up to Lex Luthor so adoringly can't be up to any good and the secret? Superman: The Videogame! Mallory reveals he had set up the online game as a means to take over the world. The game had a virus inside it that clogged bandwidth, telecommunications and generally crippled technology, except Lexcorp facilities which of course was immune and for a price was the only solution. Not only had his master plan worked but to make sure Big Blue couldn't help he had inserted subliminal coding that had forced her boyfriend to ignore her, his career at the Planet which could alert Lois Lane & Clark Kent or even worse Superman and win Mallory Chloe in the bargain. Chloe realizes she's now trapped with a mad man with no escape, cue Jimmy to the rescue in The Flying Newsroom. Mallory won't be stopped by that though and launched his orbital apartments defenses. Chloe watches in horror as the man she really loves explodes into a million pieces. Jimmy hadn't listened to Natasha when she had rushed the conversion on the old copter into a spaceship. When she advised defenses and shields he was in too much of a hurry to get to Chloe. He wasn't dead yet however, as he had at least brought an oxygen mask AND keys he had confiscated from Princess Durvella when she had first arrived on Earth. Back on Earth Perry was overseeing the workmen's progress on repairing the Daily Planet globe after the Dalwythian crash. Of course the repairs were almost complete, Durvella's ship had been sealed inside the globe because it was too heavy to remove. Naturally just as the spit and polish was being applied Jimmy activated the ships key in space. In a shower of debris the Dalwythian ship rescues Jimmy and he heads into the garbage disposal shaft of Mallory's apartment to sneak around any more missiles. When he arrives, chest all puffed up and adrenaline pumping, Jimmy is surprised to find Chloe has already pulled a Lois Lane and beat the hell out of her would be captor without his help. Chloe gets Jimmy up to speed on most of Sebastien's plan (omitting the part about him being manipulated) and Jimmy deduces that the only way to stop people from clogging the planet's facilities with the game is to stop it from being addictive. He has to make the game crap, luckily Sebastian's orbital apartment is also the programming hub. Back on Earth as people near the newest level they are hit by a shock, Superman isn't going to be in his own game anymore, you have to play the rest of the game as someone else! You get to choose someone else to replace him in his own title, Mon-El, Krypto, Lex Luthor or Alpha Centurion. Who wouldn't want to play a Superman game where Superman wasn't in it? Needless to say it works a treat. Mallory laughs, they may have stopped his plan but they were trapped in the apartment and would die there. Superman after all was on a long walk across America, right? Jimmy looks out of the window to see Superman himself, but how he thinks, he didn't activate his watch. Chloe smiles and reveals she too is a friend of Superman, because of her undercover investigation into Mallory she too has a signal watch. As the orbital apartment is steered back to Earth by Superman, inside, Chloe and Jimmy rebuild their broken relationship. They aren't quite back to being boyfriend and girlfriend, but they are definitely on the road back. Chloe, Jimmy realizes, is his greatest adventure. Story - 5: Hear me out here, as a back up feature it was a mess, simply because each segment was so short and for that reason the story just never flowed in a way that seemed natural. They were fun with several ups and downs but here in one piece the story flows well, finally makes sense in a tributary way. 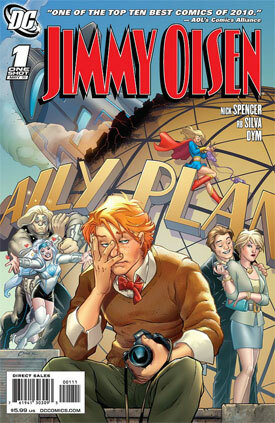 It has so many nods to the past history of Jimmy and his often trippy adventures back when he had a long running title of his own that even if you weren't familiar with them you'd feel immersed in a way that the recent episode of Batman: The Brave and The Bold that featured Superman did to fans new and old. Chloe Sullivan didn't seem characteristically correct to the girl we knew from Smallville on TV but as the story continued she definitely met expectations. I'm also surprised that Nick Spencer's swipe to the creative team on Superman were allowed! I laughed out loud at the twist with the video game and how it reflected life and feels of the fans on the current state of the books. Simply on the strength of that alone it deserved a 5/5. I'm sincerely glad they opted to publish all the mini chapters into one cohesive volume as it was a ton of fun on one dose. I would love for Jimmy to get his own title again, on the strength of this he certainly deserves it rather than a special of reprints every year. Art - 4: The art was superb, it was jarring at first. Again suffering from the segmented effect when it was split into mini chapters. The inking seemed heavy at times, the designs odd, the angles spotty and the pacing odd. Again as one piece it works, it flows, what didn't work originally, does as it is able to continue through the entire book. That said the final scenes really took you out of it. Just as you became enamored by the style the final section seemed out of place. No disrespect meant to Pinna but I wish they would have just let Silva finish off the book 100%. The sketchbook at the back was a nice touch that let you see the devotion that was put into this book. Something you don't realize when it's relegated to 'back up' status. Cover Art - 4: Amanda Conner delivers a beautifully comedic cover that conveys the fun of the interior story with ease, the problem being it's just a little too comedic. It's still a fantastic piece of art that leaves you longing for more adventure!